Curfews have come into force in more than 30 towns and cities across France after two weeks of night-time rioting. 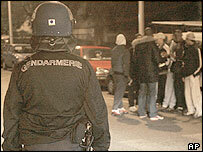 Youths clashed with police in southern city of Toulouse and there were reports of sporadic violence elsewhere. But the drop in violence seen overnight on Tuesday shows signs of continuing, said police. The Paris area, where the riots began, is said to be calm. Interior Minister Nicolas Sarkozy has ordered the expulsion of all foreigners convicted of taking part in the riots. He told parliament 120 foreigners had been found guilty of involvement and would be deported without delay. The government has declared a state of emergency in Paris and more than 30 other areas to help quell the unrest. Curfews have been imposed in the western towns of Rouen, Le Havre and Evreux and the French Riviera region among others. No-one under the age of 16 in those areas is allowed out unaccompanied by an adult between 2200 and 0600 (2100 and 0500 GMT) and is banned from buying petrol. There are no curfews in the suburbs of Paris where the trouble started almost two weeks ago. Violence has tailed off in those neighbourhoods over the last few nights and the situation on Wednesday was said to be "very calm". Across the country, there were reports of cars, two nursery schools and a car parts dealership set alight in incidents. But only 40 vehicles had been burned by 2300 (2200 GMT), a "sharp decline" compared with previous nights, police said. Mr Sarkozy told MPs on Wednesday that non-French nationals - "not all of whom are here illegally" - had been convicted of taking part in the attacks. "I have asked the prefects to deport them from our national territory without delay, including those who have a residency visa," he said. The nightly protests have gripped deprived areas where unemployment is rife and residents complain of racism and discrimination. The unrest was first sparked by the deaths in the run-down Paris suburb of Clichy-sous-Bois of two youths, who were accidentally electrocuted at an electricity sub-station. The emergency powers handed to local authorities have been invoked under a 1955 law. This is the first time they have been implemented in mainland France. They allow a state of emergency to be declared in defined areas, and can be extended by parliament after 12 days. Curfews can be implemented, police can carry out house searches and public meetings can be banned under the measures. Nearly three out of four French people support the powers, according to a poll published in the daily Le Parisien newspaper. But some opposition parties, and the French magistrates association, have described them as a danger to civil liberties. The far-right French politician Jean-Marie Le Pen told the BBC that rioters should have their French citizenship revoked.